I must say I wanted to wait a bit more before presenting what's new in Valyria Tear, but since a lot of time already flew away, I'll do a quick piece of news now! Let me introduce the great first Villain you'll encounter in the game. The mysterious and malevolent Country Lord Banesore. But this is not only what happened last month, IkarusDowned added support for passive equipment effects in battles, meaning that you will now be able to use (future) upgraded swords and other equipment pieces, giving bonus in attack, or defense. The omni-sword, a piece of equipment used to test the extreme display case. 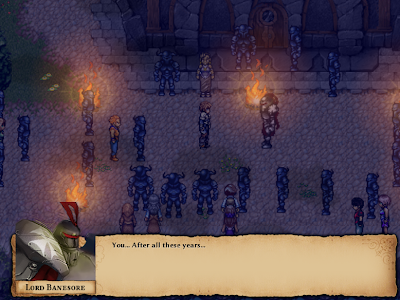 The game will now remember which repeatable dialogues you have seen and show a bubble only on new npc dialogues. This will be a great help to get to know whom you talked with. Common game data are now loaded once instead of loading them each time a game mode was loaded, which leads to less audio crashes and better overall performance! I also took the time to properly try and fix joystick support. Valyria Tear should now be fully playable using your favourite pad! Valyria Tear will now use standard paths for settings and save files, for both Windows and Linux, and auto-copy the data which was in the old location.